For a time, Borderlands' makers considered developing and releasing an official mod toolkit, but realized that its community had hacked the game apart and already accomplished much of what a software development kit would deliver. So SDK plans were shelved as redundant and unnecessary. "The best thing we could do for the community was get to work on Borderlands 2. Imagine if we'd spend a year working on an SDK for BL2," Pitchford told the Rezzed PC and Indie games expo at Brighton, England, this weekend. 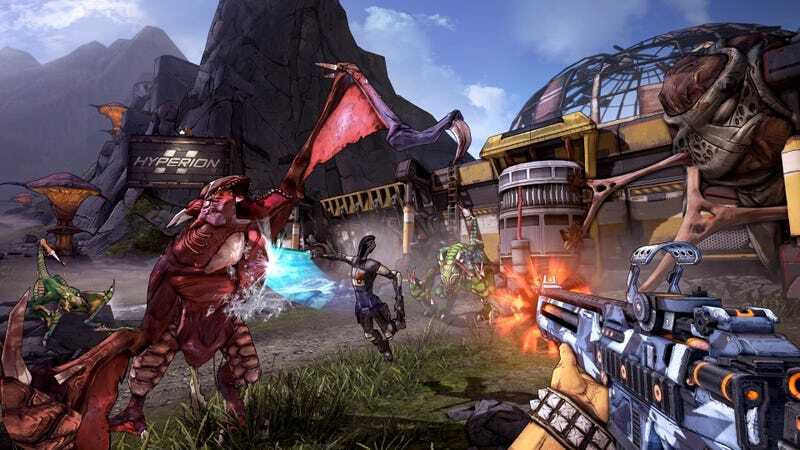 That doesn't mean Gearbox Software is going to build one for Borderlands 2—I guess because the modding community will find it can pull apart the files on the PC version the same way they did with original Borderlands three years ago. On the subject of things Gearbox isn't gonna develop but, hey, knock yourself out if you want to try, Pitchford called on the Rezzed audience to badger Sony into commissioning a PS Vita version of Borderlands. ""One of the things I wish Sony would do is get behind Borderlands, because I'd love to see a Vita version of the game," he said, according to Eurogamer. However, "We're too busy to develop it ourselves. But I know there are a lot of talented developers who could take our code, our source and our content and perhaps create something like that." The remarks were enough to incite a campaign on the Vita's subreddit to agitate for Sony to do just that, which is intriguing. Unless I am mistaken, Gearbox owns Borderlands. If it can't develop a Vita version of the game but wants to see one out there, conceivably it could find and license a studio to do so itself.